A harrowing pregnancy for Sarah Thistlewhaite has ended with a Mother’s Day gift she will never forget. Sarah was pregnant with the rarest type of twins: monoamniotic and monoplacental. 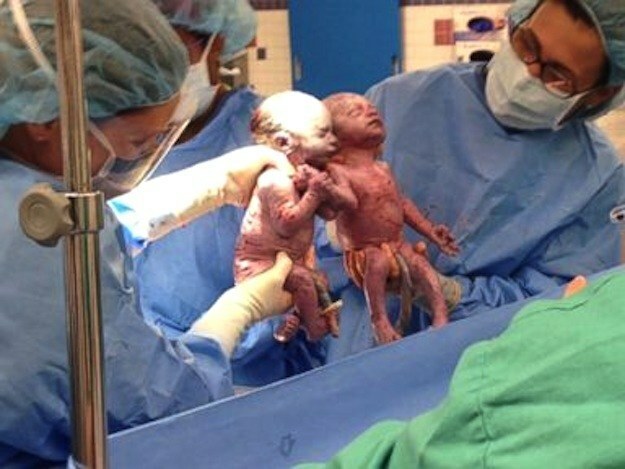 Such “mon-mono” identical twins not only share one amniotic sac ( as opposed to fraternal twins who have separate sacs and come from two distinct fertilized eggs), they also share the same placenta, the vascular bundle that nourishes a baby during gestation. Many complications can arise from sharing a placenta. Specifically the twins’ umbilical cords can become knotted which chokes the flow of nutrients to the babies. Fortunately for Thistlewhaite, her babies’ cords remained unsnarled until their delivery on Mother’s days where she received an incredible gift: the twins emerged via caesarian section holding hands!